São Paulo - A typical "paulistano" friday. In a pizza-restaurant of the the west side of the city, the staff of the Universe HQ website waits, with not little anxiety, the arrival of the illustrious interviewed, nothing less than Ivo Milazzo, one of the greater European designers of comic strips. Born on 20 June 1947 in Tortona, Milazzo considers himself as a genoan of adoption. Its collaboration with the scriptwriter Giancarlo Berardi, begun in first '70, has given life to Ken Parker, transforming it in the most acclaimed cowboy of the world-wide comic strips. In Brazil, the popular Long Rifle has become a true "cult" among the readers (read , about this, the exhaustive article "Ken Parker in Brazil". How old were you when you have begun to work on comic strips? My first professional job dates back to 1971, with a history called "The Blind" published in the "Horror" magazine, by Sansoni publishing house. How much time is passed from the conception of Ken Parker to the launch of the first issue? In 1974, when Berardi and me introduced the first episode to Sergio Bonelli (the publisher of Tex, Zagor & Co), comic strips and movie pictures were full of "western". Just for this, our first worry was to create a good history, in which often the Nature was the main protagonist. After the approval of the first number, there were three years of job since, being the series a monthly one, we ought to have enough "material". So, Ken Parker has made its debut in 1977. It is true that the source of inspiration for the creation of the character was the movie Jeremiah Johnson, directed by Sydney Pollack, with Robert Redford? From the movie have you drawn off only the character's face or also the concepts? Yes, it is true. Besides the face, Ken Parker has inherited much from the character played by Redford that, in that movie, was a good man, of sound principles, which lived on the mountains and, instead of facing the challenges of the nature, had decided to integrate itself in it, giving up to the civilization. So big has been its infuence that, at first, the character had to be called Jebediah Baker, but Bonelli had decided that its name had to be short, easier to remind. He was right! And so Ken Parker is born. In a different way from the other western comic strips, in Ken Parker there are not interminable shootings, wicked bandoleros or dirty cattle-raiders. The character is more at ease in using the brain rather than the fists. This has been decided on paper by you and Berardi also to make something different from the other series of the same kind? When we created Ken Parker it was impossible, in a western comics story, to not to have characters shooting or punching with the enemies, because in that age the life was harder. Even the women were more rough, in those times. That's why the difference had to be in the story's context, the plot. And it has been just this what Berardi has always tried to do. There is a curio: in the first issue of Ken Parker, the character has a thick beard (like Robert Redford in the movie) and then, in the following issue, there is no more beard. Would you know why? Because in Italy no bearded character enjoys success. It seems that the fans doesn't like it. So, the story has been "arranged" in a way to give to Ken an occasion to be shaved (uBC's note: he was grazed on the face). In comparision with other western comics, Ken Parker is relatively new (1974). Which are his peculiarities, compared with other works, which have allowed him to obtain such a success? I 'm not able to say it with exactitude. It is a matter of personal taste. Perhaps the reason of this success lies in the fact that both Berardi and me were a little younger than the other western comics authors at those times; and also because we have lived other vicissitudes, differently from the elders. We created the stories in a different way. To illustrate Ken Parker's stories, you made a lot of searches. Tell us a little about this argument, since many drawers ignore the importance of searching on the visual elements which compose the story. The search is fundamental in a western story. I have always tried to give many information through my illustrations. At the beginning it was difficult, because my financial situation did not allow me to buy expensive books, on which was possible to document for me. Because of this the cinema ended also to serve to me as an inspiration source. The characterization of the age in which the character lives passes through the dresses, the houses, the weapons and an infinity of other things. All this contributes to create the background of a good story! To older designers the lack of searches can also "be pardoned", but for the modern generation this is unacceptable, also because there are various resources at disposition. You are a perfectionist by nature. Is there an advice that you feel yoy would give to the ones which begin now in the world of the comic strips? Perfectionist, really? There is people who do not think I am a perfectionist. They say that mine it is a sign too much "fast". There is much people who do not love my designs, they thinks them "plain". Thanks. In truth, my sign is simplified, but is fruit of immense study. It is a style option. I use a single sign in order to make what the drawers of the classic school make with 3 or 4. It is the case, as an example, of Milton Caniff (author of the classic Terry and the Pirates). And of Marraffa - also him has illustrated Ken Parker - that follows the same line, with a style different from mine. My aim has always been to transmit, through my style, an image directed to the reader. Look at the excellent illustrators that work currently for the comics magazines. For me, they are nearer to the painting than to the comic strips design. In my opinion, the design of a comics story requires a different narrative, an other style. You think that the western style has still something to give to the comic strips? Why? Do you like some other western comics? Definitely yes. Western is an unfailing source. Is so true true that since more than 50 years Italy produces western characters, with great success. It is an inexhaustible genre, for which the passion passepassed on from father to son. They have grown reading Tex and the Little Sheriff and, later, I have known other great western comics, like Blueberry - the "real" Blueberry, I mean, that one made by Charlier and Jean Giraud, a lot before becoming Moebius, designer of sci-fi. I liked Jerry Spring also. In Ken Parker #15 (Men, beasts and heroes) there is the meeting with Tex and Zagor. How is the idea born? The fuss between the fans of the three characters has to have been immense, isn't it? My intention, in that issue, was to make an homage: and the result has been excellent, because also the fans of Tex and Zagor liked it very much. In the story appeared also Lucky Luke and other characters of the western comics. Which is your preferred Ken Parker's story? Ah, many. But I could privilege Adah (#46), Lily and the hunter (#25) and Home sweet Home (#30), because them are very human stories. Moreover, I give you a firsthand information: two of them, Lily and the hunter and Home sweet Home will be reprinted in the format of de luxe albums, giant size, in all Europe, arriving simultaneously in Italy, Portugal, Spain and France. These stories have been chosen because, during the walks that Berardi and me walked together in France, we observed the total lack of western stories of this kind. Something of "sentimental"! In the first we have depicted a man with his dog on the snow, in the other Ken Parker returning home to meet his parents. I must say that Lily was the name of my small she-dog! Here in Brazil Ken Parker enjoys the favor of a legion of fans. Now the character return to be published among us, by two publishing houses, Tendência and Mythos. What you would say to the readers that still doesn't know the character? I would say them to buy or to borrow the magazine! (laughs) Joking aside, I would make an invitation to the new readers - so that they will know the character - and to the earlier readers - so that they will meet him again. I would just to praise the brave job of Tendência, because it is difficult to work with comic strips stories published in book format. Only in France this genre is widely recognized as literature. In the rest of the world it is a cultural by-product, relegated to the newspaper stands. Just for this, the concept of "comics books " is still little ingrained. But the reissues are very beautiful, with a new translation, a quality paper and in their original format: the readers have appreciated a lot, that makes me very happy. 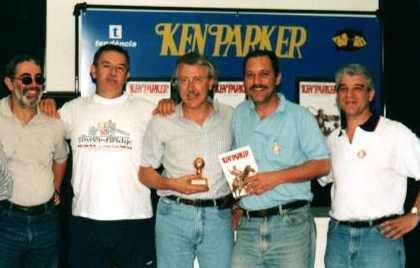 Apart from Brazil, in which other countries has Ken Parker been published? Ken Parker has been published, with success, in 13 or 14 other countries, like Turkey, Greece, Spain, Yugoslavia, Holland, France and Scandinavian countries. In the United States and South America (except Brazil) it has never been published, unfortunately. 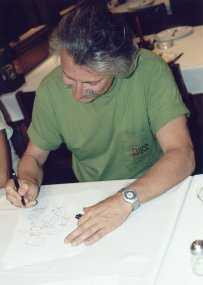 Ivo Milazzo in Brazil with the prix "Minissérie estrangeira"
You and Giancarlo Berardi have formed a couple that is thought one of the best in the field of the creation of western comics, but your last work together dates back to January 1998. There are plans for a return to the "old times", will you create something together again? Just because we had worked together for a long time, we have decided to go along different ways, in order to vary our "production", and the success has arrived for both of us. But we have some work plan together, that is the "multinational" publication of Ken Parker (Italy, Portugal and France), in more accurate and in color editions. Which comics you read? Which were your comics-related idols? I have had many idols, but I have an awful memory and I could forget someone. For this, I would not want to cite names. But, as I always say, my idols are the persons who have taught me something of technical and who have improved my professional competence. Currently I read not much comics, and for two reasons: one, in order to not be influenced; two, because I like the stories whose design is in a well balanced relation with the text, that is unusual in our days. Is there a character which you would like to design, but you never succeed to? Hummm... I don't think so! I could consider me a realized professional. During my youth I thought to work on some character of Galleppini, Hugo Pratt and of the designers of the magazine "L'Intrepido". Then, after to have become "professional", those dreams are vanished. Of Hugo Pratt's ones I had a special fondness for the character Ernie Pike, a war correspondent. Would you illustrate superheroes comics? Superheroes? Not! Well, if they would pay me for... First of all, I am a professional. Which is your opinion about superheroes comics? In Italy, currently, they occupy an important place in comics' market? Today, in Italy, superheroes occupy a much narrow and small slice of the market. The sales' champions are the manga. The fever of the moment is constituted by the Pokèmon: they sell more than Mickey Mouse. Do you know the Brazilian authors? What do you think about their works? Yes, I know some of them. 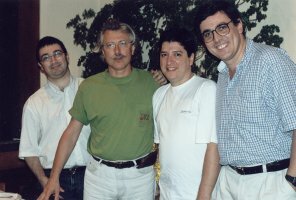 Mauricio, Laerte, Ziraldo, Angels, Miguel Paiva. Mauricio is the Brazilian Disney. The others follows a more witty line, that is very peculiar of your people. Talk to us a little more about your recent works, as an example the 13th "Texone" and Shado (an adventure of the new Bonelli series, Magico Vento). Of Magico Vento I have already illustrated 3 issues and delivered a fourth one. The series is sold very well in Italy, that makes me very happy. Which are the projects on which you are working currently and which are your plans for the future? Many are the projects on which I am working. One of them is To tell Genoa - Routes to the Search of Aromas, Flavours and Curios, a city guide - that will be published in 2001 - in which I show, through aromas, flavours and details, the "old" Genoa, which risks to being forgotten. There is also an invitation of a Brazilian author to realize a comics album on the participation of the FEB on the battlefields of Italy during the Second World War (note: the FEB was a Brazilian contingent); a series about an iroquois Indian, set on the Adirondacks mountains, which will tell about his relation with the dreams; and a comics version of Don Chisciotte, by Miguel de Cervantes, in collaboration with Jorge Zentner (Argentine author who lives in Barcelona). Have you already read the version of Don Chisciotte by Will Eisner? I did not know that Will Eisner, that I consider an "immense" artist, had made an adaptation of Don Chisciotte, but I can assure you that I will not see it until I will have not finished mine, in order to not run any risk of being influenced. Is there a designer who you would liked to see at work on Ken Parker? What a difficult question! I do not know, the great names are many... But I would cite Alex Toth, which is a great artist, he has the gift to synthetize the design and dominates like few the techniques of chiaroscuro. Ivo, we are enormously grateful to you for this interview! I hope that your readers would like it. A huge hug to everyone! A special thanks to Wagner Augusto, of CLUQ (Clube dos Quadrinhos), for have incited us to carry out this interview.